We've got a special something for the movie buff in you! Introducing 'Paytm Movie Pass', your ticket to unlimited entertainment for an entire month. Now, treat the movie enthusiast in you with an offering that is absolutely irresistible. Let's put an end to your curiosity and tell you how it works.Buy a pass and use it to book tickets for up to 4 movies in a month. Enjoy a hassle-free experience and get 100% Cashback on every booking. This offer is applicable on cinemas in 'Vijayawada' available on Paytm. The special 'Movie Pass' code will be received post purchase via SMS/E-mail. Use your unique code to get 100% Cashback on the ticket price of Two movie ticket. 'Movie Pass' code received is only applicable for booking movie tickets on Paytm website and Paytm App. Promocode received is valid for 30 days from the date of purchase. Not valid on Director's Cut, 4Dx, Insignia, Gold Class Cinemas & IMAX Screens. The 'Couple Pass' entitles the user for 4 orders of movie tickets within 30 days of the purchase date. The 'Couple Pass' holder is entitled to watch a maximum of one movie a day and 4 orders of movie tickets within 30 days of the purchase date. 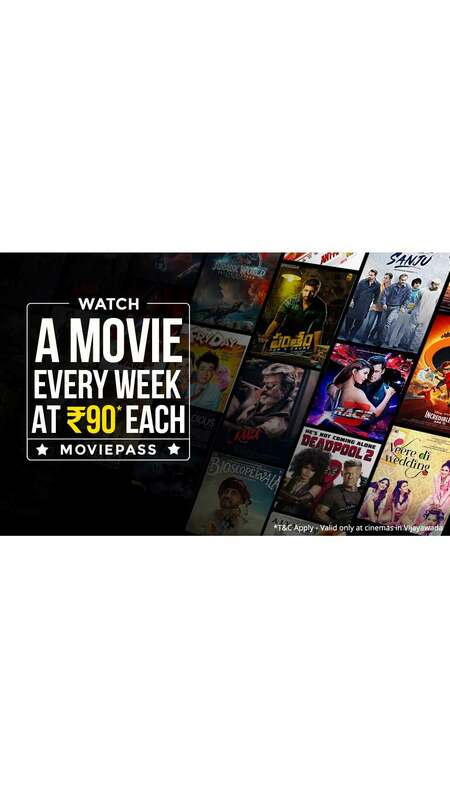 Customer will able to book movie tickets within the value of Movie Pass purchased. A customer can place a maximum of 10 orders of movie tickets during the Movie Pass campaign. Paytm solely reserves the right to change/modify or stop the campaign without any prior notice.